Great post. A fitting tribute to a great and witty scholar. One of my favorite examples in print of the latter trait comes at the end of his essay in Law and Legal Process: Substantive Law and Procedure in English Legal History (CUP, 2013), where he writes: ‘My goal, however, has not been to reform the English legal curriculum. That would be an arrogance too great even for an American law professor.’ Hard not to laugh after reading that last sentence. Since you devoted considerable space in your post to print and online editions of medieval church court records, your readers might like to know that Donahue is in the process of preparing a volume for the Selden Society entitled ‘Select Cases from the Ecclesiastical Courts of York, 1300-1500.’ How close this volume is to being published, I have no idea, but it should prove to be an invaluable resource for historians of medieval canon law when it comes out. Dear Travis, thanks for your reaction! 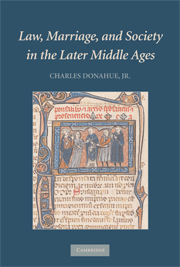 It is good to know that we can eagerly expect a new source edition by Charles Donahue concerning medieval ecclesiastical courts. Property Talk in Old English: Did Anglo-Saxon England Know the Concept of Seisin? Dear Travis, thank you for the detailed information about the essays for Charles Donahue!